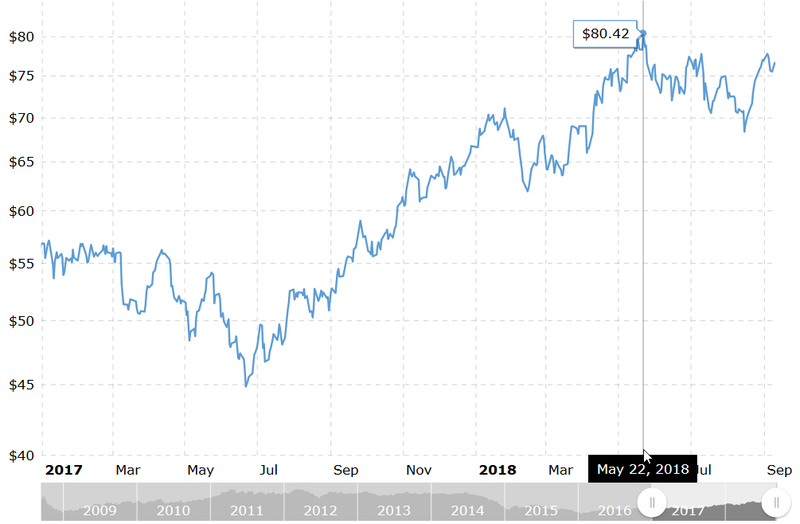 Crude prices have been declining the past few months as there’s a perception of an oversupplied market and added tension in trade talks with China. In October 2018, oil prices did bounce back as a result of OPECs announced 1.3 million bpd cut. 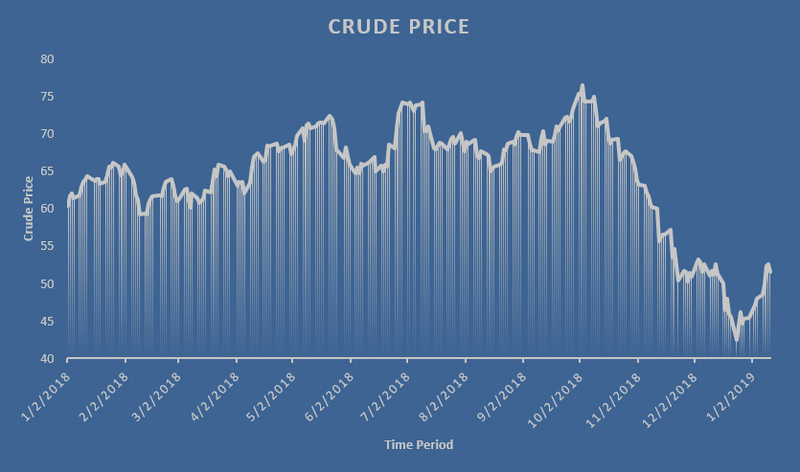 Towards the end of the year crude prices witnessed levels below $50 a barrel (including touching a low of $42.53 on December 25) for the first time since October 2017 on signs of an oversupplied market. Falling crude prices have had a direct impact on E&Ps. According to data from Baker Hughes, the rig count has increased from 480 in August 2018 to 488 in January 2019, however completions have since slowed. Operators seem to be hyper-focused on their drilling programs vs. their completion programs through Q4. This is typical as they aim to reposition their hedges and lock in better terms with pressure pumpers. Analysts look at the length of laterals, frac sand quantities per well, and frac stages per well or even count the stimulation crews (aka frac spreads, frac fleets) to analyze production estimates. Our metric, the Frac Spread Count, does the latter and we’ve uncovered a slow down in the Permian that recently has taken a turn for the worse. The permian basin frac spread count has decreased from 192 (in June of 2018) to 140 (as of January 2019) representing a 27 % decline. The overly optimistic number projected by companies during the period of 2014 to 2017 in the Permian basin seems to have not lived up to their expectations. 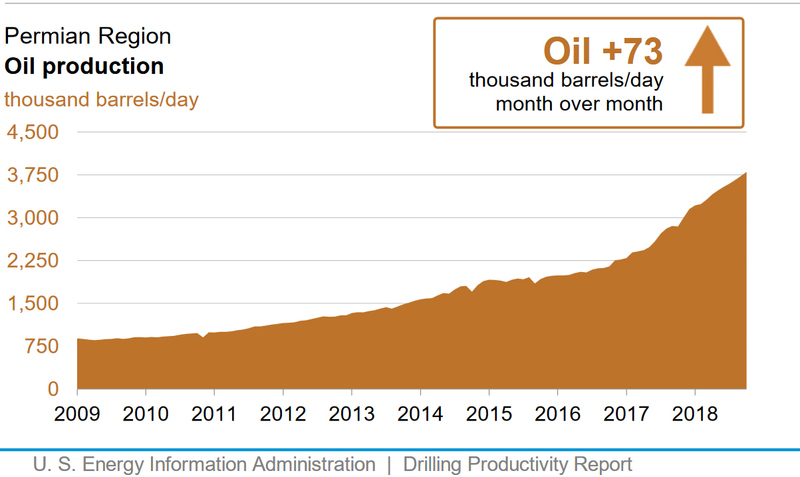 The below chart represents the increase in oil production in the Permian Region from 2009 to 20182. According to Schlumberger CEO Paal Kibsgaard, the trend in the Permian basin is similar to the Eagle Ford shale play, which indicates that producers there have run out of new “good rock” and are trying to get every bit from the known sweet spots. In the Permian’s Midland Wolf Camp section, child wells are already approaching 50 percent of new wells drilled3. This being said, many operators can hold on with crude prices hovering around $35 though they would be most comfortable in a $45-$50 range per our research. However, this will have an impact on new drilling, the DUC count (drilled yet uncompleted wells) and ultimately the frac spread count. With a 40% drop in crude prices since October 2018 pressure pumpers are being challenged to manage demand in a market where roughly 500 spreads are ready to work. We’ve seen frac spread utilization go from over 90% to under 80% in less than a year. Frac spread utilization will be challenged and from our research frac spread capacity is scheduled to increase throughout the year as pumpers tie their futures to newly opened pipelines. OPEC and its allies have agreed to reduce output by 1.2 million barrels per day (bpd) from January, in a move to be reviewed at a meeting in April. However, in the near term, the key global trend to watch out would be Chinese oil demand and accurate supply cuts from OPEC and non-OPEC that may drive crude prices higher4. Our forecast calls for a stabilization in the oil markets, followed by a rally in completions as we approach the spring. The issue here is the pain that oilfield service companies will feel in the short-term. Will we see more electric fleets be ordered that seem to have long term financial benefits? Will we see operators continue to switch pressure pumpers in an effort to cut costs? Are the oil markets really going to hold and/or rally? These are the stories we’ll be following. In a recent activity, the natural gas producer Southwestern Energy (SWN) forged a deal with Flywheel Energy, LLC (founded last year with the backing of Kayne Private Energy Income Funds) to sell off its Fayetteville Shale E&P and related midstream gathering assets for $1.865 billion in cash. SWN’s assets in the region include approximately 915,000 net acres, 4033 production wells, 3.7 Tcf of reserves, anticipated 2019 production of 225 to 230 Bcf and midstream gathering infrastructure and compression. In addition to the deal, Flywheel Energy will assume approximately $438 million of future contractual liabilities of SWN. The aforementioned deal is expected to close in December 2018. SWN founded in Arkansas (aka Fayetteville) sold off its native state assets shouldn’t come as surprise to anyone. SWN’s own share has fallen from $39 in 2014 to $5 in 2018. As per a statement made by SWN’s President and CEO, Bill Way, the company will now focus more on its higher margin Southwest and Northeast Appalachia assets. They invested over $600 million in the next two years to further develop their liquid-rich Appalachia assets and will accelerate the path to self-funding. 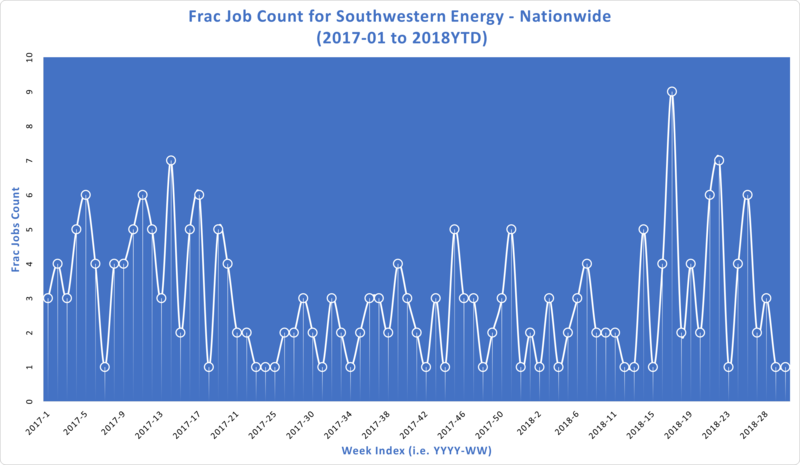 According to our data, SWN, in 2017, had a weekly average frac job count (reflects the number of completions performed by the company) of 4 with the highest of 7 being achieved in 14th week. In 2018 (up to July), the company has a weekly average frac job count of 6 with the highest of 9 being achieved in the 17th week (see Figure 1). This clearly shows they companies stronger operational performance in the year 2018 as compared to the previous year. 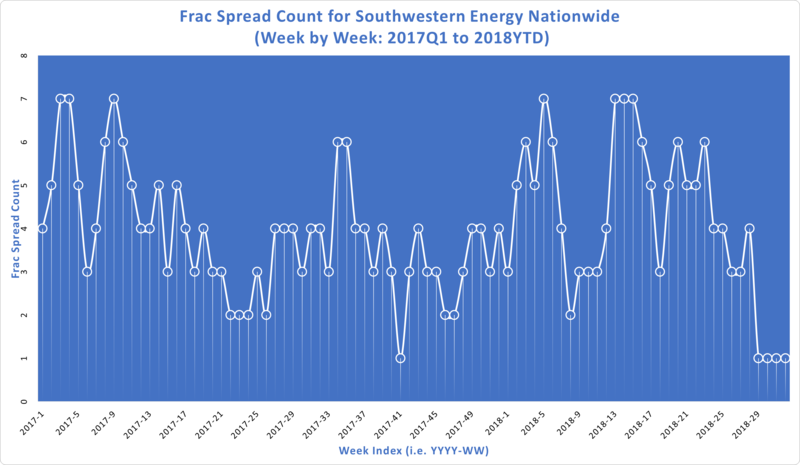 In terms of frac spread count (pressure pumpers or fleets used by the company), SWN had a weekly average of 4.5 in 2017, whereas in 2018 (up to July 2018) the company had a weekly average of 6 (see Figure 2). Does your company need to know who is servicing the operators in your region? Oil companies rarely publish data on their service companies, so Primary Vision has developed techniques for estimating hydraulic fracturing equipment activity in the United States and Alberta, Canada using numerous target sources. Drop us a line at info@pvmic.com if you want to learn more about our data. We also released a new report on fracspreadcount.com that highlights prolific operators, pumpers by proppants, spreads and completions. Order it today! Bitcoin had a remarkable run in 2017. Many traders and speculators even suggested Bitcoin to be a long-term asset class that may be used in portfolio construction with proper diversification. On the other hand, oil being one of the largest traded commodities has been one of the most valuable economic indicators. The largest traded commodities of oil are WTI and Brent whose price has always been quoted in dollars (USD). WTI, or Western Texas Intermediate, is extracted from U.S. oil fields. This variety of crude is considered very sweet and light (technically medium as its density is lower and sweeter because of the low percentage of sulfur). Brent crude has similar qualities (low sulfur and density) originates from the Black Sea and is typically the benchmark for pricing for multiple regions inside Europe, Africa and parts of the Middle East. We looked to see if any correlations exist between Bitcoin and Crude. Crude has always had an interesting correlation with the US dollar. When the dollar strengthens, oil prices fall and vice versa. This correlation has however begun to change after the shale revolution where US imports of oil have reduced drastically by almost 60% from 2008. [Business Insider] On the other hand, the volatility of cryptocurrency prices is based on a multitude of factors ranging from governments banning crypto trading to certain individual and institutional investors. The sudden spike and correction in the past year has largely been due to market speculation by wealthy crypto traders. One of the main reasons for the strength in the US Dollar has been an increase crude prices. As has been seen in fig 1 and 2 below, both Brent and WTI prices have increased since July of last year while Bitcoin prices were relatively flat. Rising oil prices have been tied to a long history of issues related to supply and demand, geopolitical unrest etc. etc. Recently Iranian oil exports started declining resulting in a surge in oil prices as Iran produces around 2 % of the global oil supplies (equivalent to 3.8 million barrels per day as of April 2018). Besides Iran, the on-going tensions in Saudi Arabia and Iran, continuing conflicts in Iraq, Libya, Syria and Yemen have also impacted oil pricing. There are emerging disagreements with Saudi Arabia and USA over no action being taken in the story of Hosnain Mubarak, the former Egyptian president and ally of Saudi Arabia. This in turn could have an impact on pricing. The point is that its hard to quantify all of these indicators at every turn. Though the Bitcoin may have no direct correlation to crude pricing, there are strong possibilities this may change. The emergence of the PetroBTC – trading commodities like Crude in Bitcoins may be more profitable for long term positions. This could replace trading oil in USD resulting in potential devaluation. Countries like Venezuela, which have huge oil reserves have introduced oil-backed crypto-currencies that might help their struggling community. This currency is in its infancy and has been controversial to say the least. Russia, Saudi Arabia and Iran are also rumoured to be moving towards petro-crypto-currencies. The question that remains is how the US dollar will unfold if the Gulf Cooperation Council (GCC) and major oil producing countries begin to trade oil with Bitcoins. Following the USD and Bitcoin story may be without drama in its first act, but for how long? We also released a new report on fracspreadcount.com that highlights prolific operators, pumpers by proppants, spreads and completions. The Permian Basin is white hot right now and supply is running thin. As Bloomberg recently reported, the massive shale deposit in western Texas is quickly becoming one of the world’s top producing oil fields. If the Permian were an OPEC country, it would be the fourth largest and by the end of the year it might leapfrog Iran and be the third-biggest (hypothetical) OPEC nation. The Permian has boomed in recent years and helped drive down the price of crude both in West Texas and around the world. Its success comes from excellent geology combined with a prime location in a historically oil-friendly region. Now improving technology and efficiencies will keep the basin competitive even if oil prices recede. Plus, recently, one of the strongest players in Permian frac’ing just got bigger. Concho Resources traces its roots back to 1997, when one of the Permian’s oldest and best known production companies, Parker and Parsley, merged with T. Boone Pickens’ Mesa Petroleum. One of Parker and Paisley’s executives, Tim Leach, split off and made a number of investments that would eventually become Concho Resources in 2006. Since then, the company has continued to gobble up assets and rivals in the Permian. On March 28, Concho announced its latest acquisition, RSP Permian. RSP is a smaller independent oil and gas company that has focused its efforts exclusively on prime unconventional acreage in the Permian. As our frac job data shows, RSP is about a third the size of Concho when comparing number of completions. 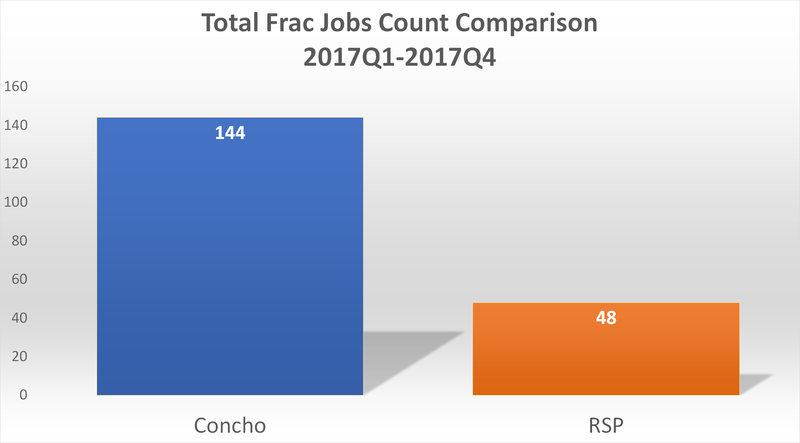 RSP completed 48 frac jobs last year while Concho completed 144. 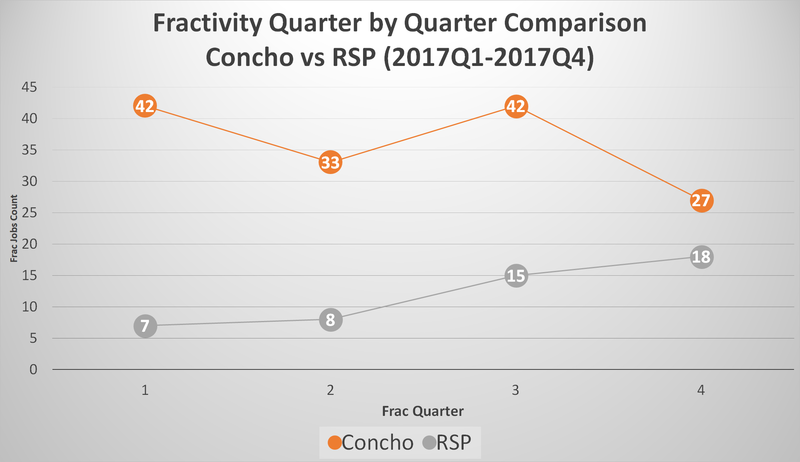 Our proprietary “fractivity report” shows that Concho had 178 frac jobs in the first quarter of 2017, but only 111 in the last quarter. RSP, on the other hand, had 30 frac jobs in the first quarter, 33 in the second quarter, 66 in the third, and 73 in the final quarter of 2017. That steady growth no doubt made it a prime acquisition target. The data in the above charts may have a small lag, but is over 90% complete at press-time. Concho brags that the merger with RSP will reinforce Concho’s position as the largest crude oil and natural gas producer from unconventional shale in the Permian Basin. The combined company will have approximately ~27 rigs working on 640,000+ net acres of land. Both companies have historically focused on core Permian assets, making their combined acreage very strong. Concho says the acquisition will allow it to save money on operations while growing its production faster. It turns out there is one major service company both Concho and RSP already have in common. 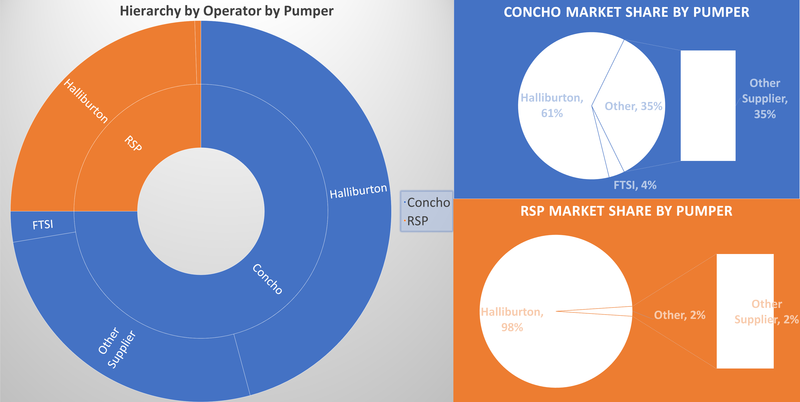 By our estimates, RSP has over 95% of its pumping done by Halliburton while Concho gets about 60% of its pumping from the same company. This means that now Concho will get the vast majority of its pumping from Halliburton, and as we previously discussed Halliburton has been aggressive in adding to its frac’ing fleet as both WTI and U.S. production continue to rise. The Concho/RSP combo benefits from the 128 spreads Halliburton has to offer, HALs local Permian Basin infrastructure and long-standing experience as the #1 pressure pumper in the United States. Just a few weeks ago, we updated you that Halliburton was putting more equipment to work than was being reported in the media. Now we are revising our estimates even higher after uncovering new data on the company’s activities. The company just reported a 34% revenue jump in the first quarter of 2018, a jump the company largely attributed to higher demand in North America. Rising oil prices certainly helped as well. CEO Jeff Miller said on an April 23 call that the company is also benefiting from a “tightness” in the hydraulic fracturing market. In fact, fracking spreads across North America are virtually “sold out” at the moment. Primary Vision agrees with this statement as we discussed supply with the Wall Street Journal just this past week. He said that high fracking equipment utilization rates are both limiting supply and degrading existing equipment. He also pointed out that the ratio of rig counts to frac spreads has narrowed from 4:1 to 2:1, something we know that analysts are watching closely. Are we getting more efficient or wearing down gear at an accelerated rate? Mr. Miller has a good reason to be confident in his company’s ability to continue to thrive after posting a solid profit to begin 2018. For one thing, he noted that the company’s new Q10 pumps are able to hold up to the rigors now facing the industry. As we reported previously, Halliburton has been responding to the industry upswing by both putting newer Q10 frac pumps into the market and also reactivating older systems that were “cold stacked” following the 2014 price crash. We are revising our estimates today to reflect our new findings that Halliburton has activated 15 additional frac spreads in the first quarter of 2018. That means we believe the company now has 128 marketed spreads instead of our previous estimate of 113. Our overall marketed horsepower estimates are also increased to 4.6 million from 4.2 million. 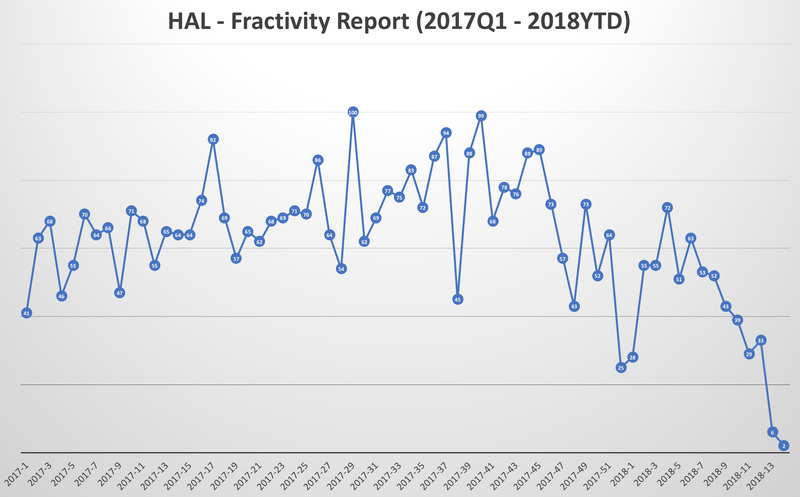 Our estimates are built on a proprietary system that analyzes numerous target sources, but Halliburton’s “fractivity report” over the past year shows that their activity has been growing steadily (ignore the dip in recent months, as the data has a natural lag of about 12 weeks that we compensate for in our estimates). Primary Vision is a leading supplier of data on hydraulic fracturing equipment activity in the United States. Contact us to purchase access to more detailed information, and stay tuned for insights into the recent merger announcement by Concho Resources and RSP Permian. On March 6, 2018, Seeking Alpha reported that Halliburton’s frac’ing fleet was surging across the country. This is, of course, a great news story for the American oil and gas industry. The U.S. government’s statistical agency expects both oil and gas to hit record levels of production in 2018, and almost all of the growth is coming from frac’ing. Halliburton is a huge part of this, though there is some disagreement over just how fast Halliburton is ramping up. Who Knows What Halliburton is Doing? Halliburton has a strong foothold on fracturing services in the United States (see information box below). They’re required by law to make some disclosures, but the company is not in the business of publicizing all of its work. As a result, industry watchers are left to make their best estimates about what Halliburton is doing. on active frac’ing operations from lagging data sets. The article states that Halliburton grew its frac’ing fleet by 700,000 horsepower in 2017, giving it a total of more than four million horsepower of frac’ing equipment under its control. The information in that article was supplied by Rystad, a Norwegian based company that offers consulting services and business intelligence to the oil and gas space. We have a slightly different view. Primary Vision estimates that Halliburton currently has 115-120 marketed frac’ing operations, called frac spreads as of the writing of this blog. Each spread is powered by roughly 36,000 horsepower of pumping equipment and also contains other necessary equipment, like data trucks, storage tanks, and frac’ing fluid blenders. Our estimates of both Halliburton’s active (108) and marketed spread count (115-120) ramped up much faster than others. We think the company actually increased its fleet operations over the course of 2017 by about 1.2 million horsepower, not 700,000. Frac Spread –  A frac spread (or sometimes referred to as a frac fleet)is a set number of equipment that a pressure pumper (oil field servicecompany) uses for hydraulic fracturing. This includes a combination of fracturing pumps (also referred to as frac pumps and/or pumping units), data trucks, storage tanks, chemical additive and hydration units, blenders and other equipment needed to perform a frac stimulation. Active Spread – Equipment that a pressure pumper has working or active in the field. Marketed Spread – Equipment that a pressure pumper has ready to work and available to work but might be in transition or in process of being deployed. 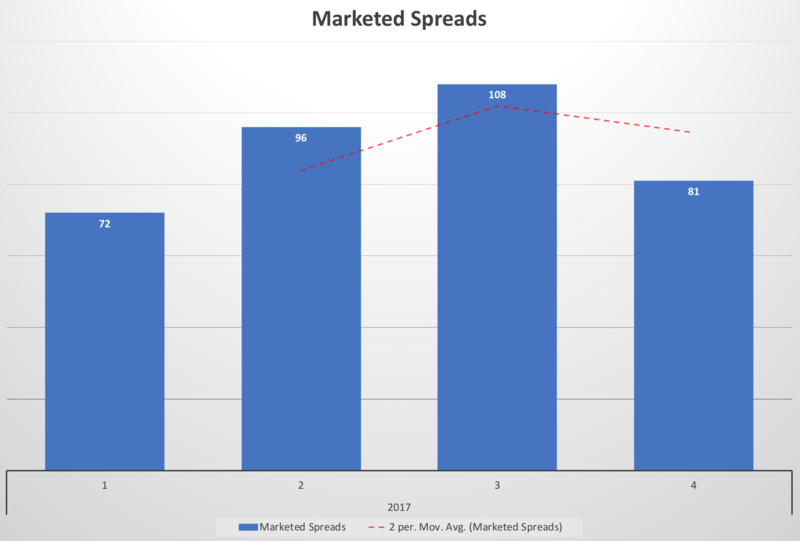 We estimate that Halliburton went from 72 to 108 active spreads between the first and third quarters of 2017. This run up, coincidentally or not, correlates closely with a March 2017 announcement that two competing frac’ing companies, Schlumberger and Weatherford, were going to create a joint venture called “OneStim.” That idea was abandoned at the end of 2017, with Schlumberger instead simply buying Weatherford’s assets. Where is the Extra Capacity Coming From? One unique strength of Halliburton is that the company manufactures its own frac’ing pumps. The latest and greatest version is the Q10 pump, which is the centerpiece of the company’s “Frac of the Future” system. Halliburton reportedly began replacing its pumps with Q10s in 2013. 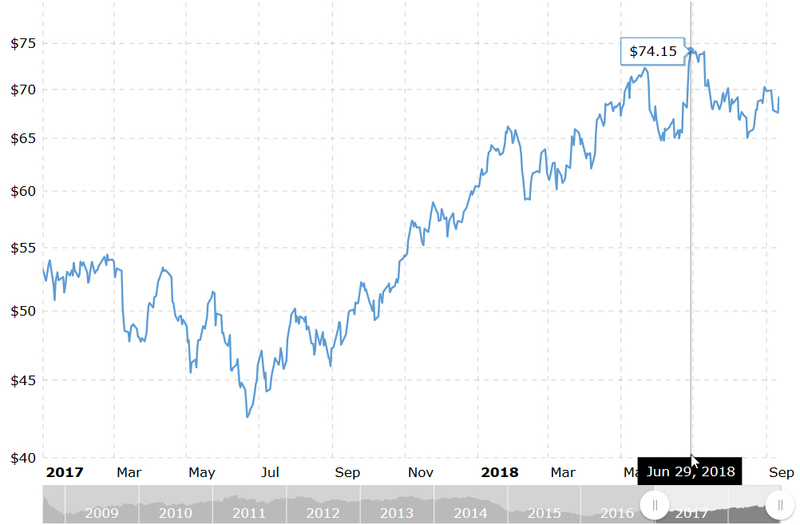 When oil prices really began to crash in 2014 the company appears to have accelerated its retirement of the older pumping systems. The company said some of its older equipment was being retired permanently while other equipment was being “cold-stacked” and could be brought back into service later. In 2016, then CEO Dave Lesar, (he retired on June 1st of 2017 and was replaced by Jeff Miller) said that if the market ever turned around, Halliburton would have “multiple levers” it could pull, including accelerating the manufacturing and deployment of the Q10s and presumably also reactivating some of its older equipment (ie. Grizzly™ pumps). We believe that Halliburton has activated more of the old equipment than other analysts are assuming. These assets were quickly deployed in response to both improved market conditions and presumably also the threat of competition from the likes of OneStim, other competitors as well as new entries such as Pro Frac, and Alamo Pressure Pumping. As a result, Halliburton’s industry-leading frac’ing fleet contains a mix of both new and old pumps. We estimate that Halliburton has approximately 4.2 million horsepower marketed. Looking for data like this? Many businesses need to know exactly how much frac’ing is happening in the U.S. and Canda. 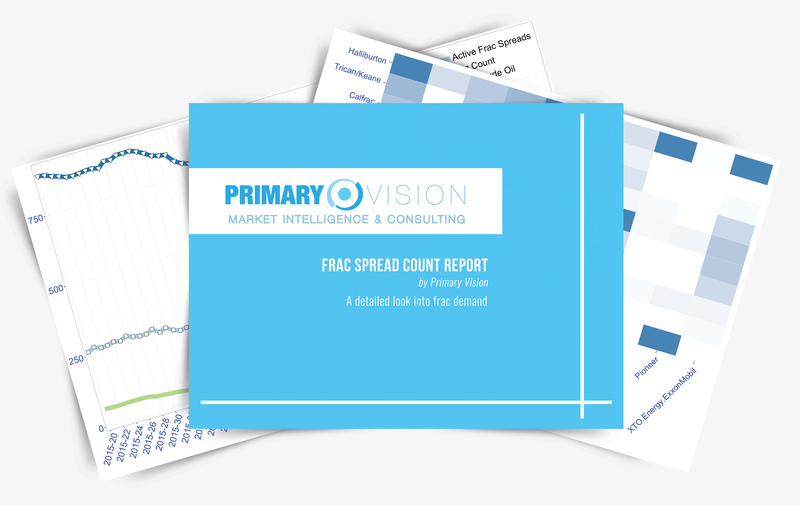 Primary vision’s flagship product, the Frac Spread Count, provides both high-level aggregations of industry-wide data and detailed information on each service provider’s activity in each region. 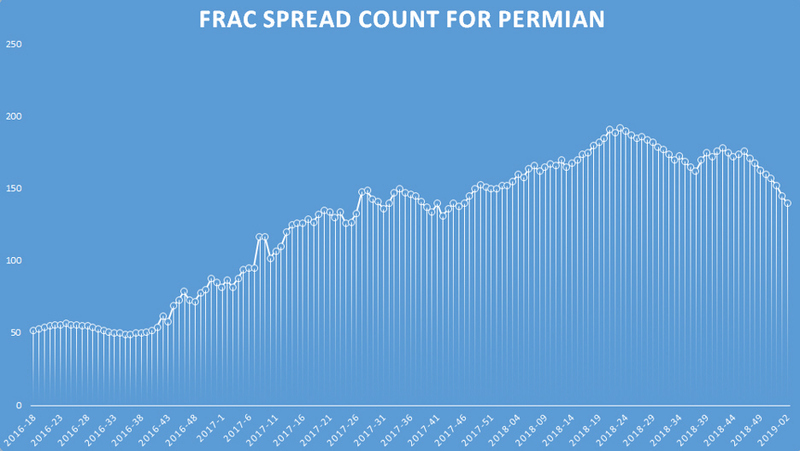 Our Frac Spread Count has grown in popularity since its inception in 2013. Primary Vision has just released the Winter Update to its flagship Frac Spread Count Report. Many casual industry observers are familiar with the Baker Hughes count of active drilling rigs, but we believe it is just as important to track the number of active hydraulic fracturing operations, known as frac spreads. These frac spreads are units made up of fracturing pumps, data trucks, storage tanks, chemical additive units, hydration units, and blenders. We use cutting edge technology to tell our customers how many frac spreads are operating across the industry, along with granular data on each company in each shale play. The Winter Update validates our previous predictions that, at least in a number of key basins, the industry is focusing on completing already-drilled wells. The drilled, yet uncompleted, wells are called “DUCS.” Many analysts have taken to calling America’s DUCS the “fracklog.” This abundance of pre-drilled wells allows American producers to ramp up production quickly if (and when) OPEC tries to drive up prices. Data from the U.S. Energy Information Administration shows the number of DUCS at a record 7,483. Saudi Arabia is seeking to open its state oil company up to investors by the end of 2018, and it needs a high oil price to get the best possible deal. To that end, the Saudis have been doing their best to enforce production quotas on OPEC members. We believe based on our research that the OPEC deal on quotas is likely to hold for longer than most in the industry assume. Rising oil prices have a very direct effect on the number of frac jobs completed each year. The count of active frac spreads has risen only slightly, because the U.S. fleet is largely already deployed, but the number of frac jobs completed is rising. 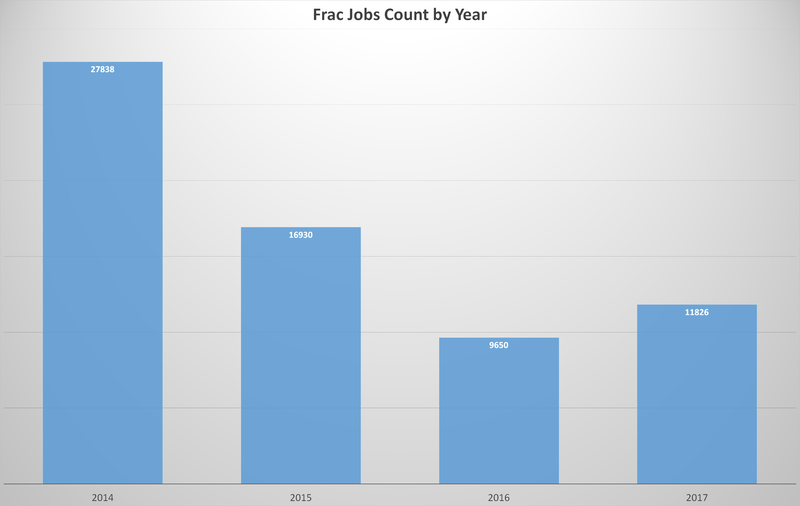 27,838 frac jobs were completed in 2014 before oil prices collapsed, and then the number dropped to 16,930 in 2015 and appears to have bottomed out in 2016 at 9,650. Activity has now turned around and in 2017, 11,826 frac jobs were completed as of the writing of this article (PV believes the total will be closer to 13,000 after all completion reports are filed). 2018 will continue the surge. Most government and industry forecasts are overly focused on drilling and fail to properly account for completions. Their data is also often based on information that is dreadfully out of date, as it can take months for well activity to be reported, if it is at all. The EIA, for example, now estimates that U.S. crude will hit a record average of 10.6 million barrels per day in 2018 and gas will also hit a record of 80.3 billion cubic feet per day. We believe these estimates fail to account for the near full deployment of frac spreads. Primary Vision continues to predict that companies will focus on DUCS, leading to more frac spreads than active drilling rigs in many regions. 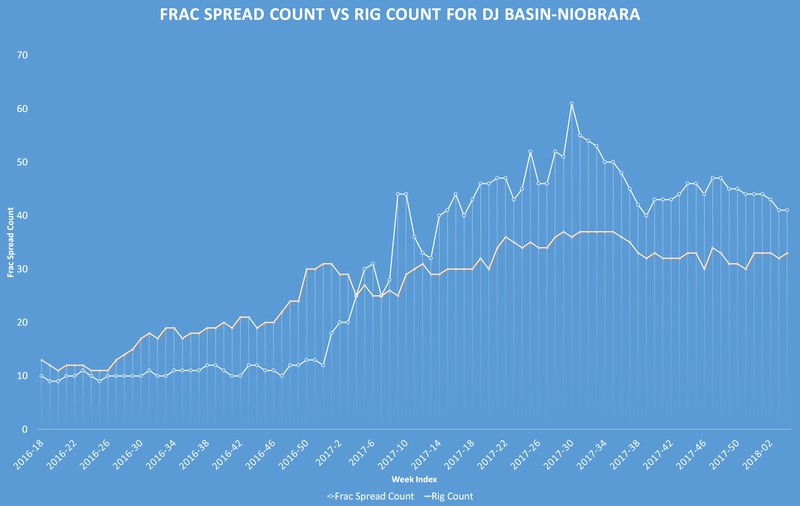 For example, in the DJ Basin-Niobrara, active frac spreads surpassed drilling rigs in early 2017 and have maintained a steady lead. Similar dynamics were at play in the Williston and Utica plays. We also look for operators to further explore the Duvernay and Montney formations which seem oil-abundant in western Canada. Our reports are trusted by companies large and small, as they are a unique source of both industry-wide frac’ing activity along with more detailed data focused on each company and each play. Our proprietary system collects data from countless public and private sources and uses sophisticated techniques to produce real time frac spread counts from this sometimes dated and incomplete data. We also have detailed data on water, proppant, and chemical usage. Get in touch with us today to subscribe to our reports or just order a sample. 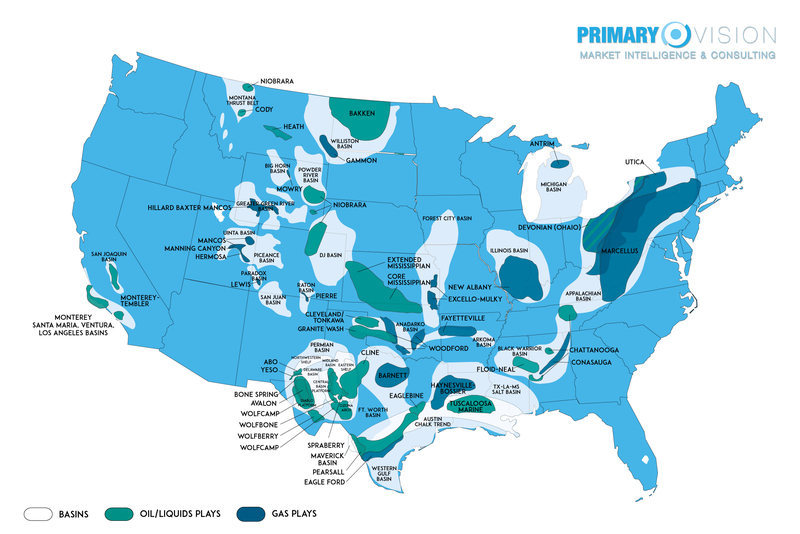 A couple weeks ago we released our U.S. Frac basin map for free. You can get that one here. This week, we’re releasing our Canada frac basin maps. Canada is rich in natural resources, but has experienced a painful decline in activity due to recent market conditions. In terms of spread activity we see the U.S. experiencing 10-1 the activity over Canada, however this could change as the market begins to recover over the next 12-18 months. Feel free to share this map, use it in a presentation or print it out! Just make sure to source Primary Vision, Inc. THE MOST RECENT OFFERING FROM US AT PRIMARY VISION IS THE FRAC SPREAD COUNT REPORT, WHICH OFFERS BOTH WEEKLY UPDATES ON PROJECTED ACTIVITY AND ACCESS TO OUR HISTORICAL DATA. CUSTOMERS CAN GET THE INFORMATION IN TOP-LINE CHARTS THAT CAN BE EASILY DIGESTED OR THROUGH THE REAMS OF MORE GRANULAR DATA THAT WE ALSO SUPPLY. YOU CAN SUBSCRIBE TO OUR REPORT AT WWW.FRACSPREADCOUNT.COM. YOU CAN ALSO CONTACT AT INFO@PVMIC.COM FOR MORE INFORMATION OR A DEMONSTRATION ON HOW OUR PRODUCTS CAN HELP YOUR BUSINESS. 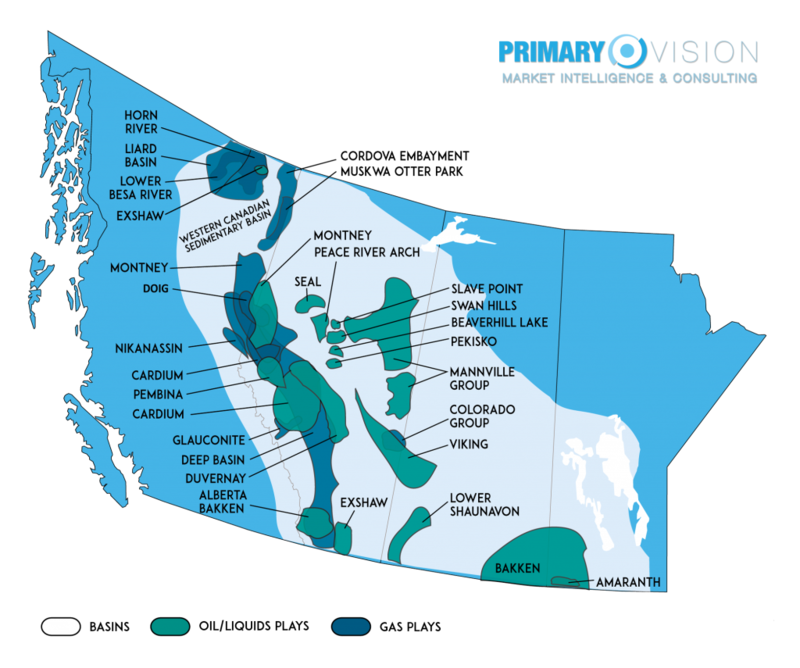 We’re releasing for free our Primary Vision Frac basin maps. Feel free to use them for an upcoming presentation, backdrop on your computer or if you’re looking for something to printout. Soon we’ll give you the ability to download these from our website in high Definition. Canada is almost ready and will be released next week. What’s your favorite Basin to work in? Least favorite? let us know in the comments below. Please source “Primary Vision, Inc.” when using the maps for educational or commercial purposes. Big Data is radically changing how businesses makes decisions. Where intuition used to dominate, companies are now thinking carefully about the kinds of questions that come up in their work and how Big Data can help answer them. In the oil and gas business, companies often want to know where drilling and fracturing is happening so they can find markets for their services. Other companies want to get a detailed market outlook so they can determine if they need to expand or cut back on costs. Billy Bosworth, the CEO from DataStax, one of the top cloud computing companies, has a saying that “Ten years from now, when we look back on how this era of big data has evolved…We will be stunned at how uninformed we used to be when we made decisions.” This quote, now a couple years old, is still extremely relevant. I was thinking about this recently while reading a blog post from Tom Smith at the Big Data Zone. He interviewed a couple dozen executives involved in Big Data and then shared some interesting insights. He says that companies should remember where data is coming from, and that “mixing corporate crown jewels with crap from the internet is not smart.” Curated data must be cleaned up, and there are a variety of ways of doing this. The real value of Big Data, in Mr. Smith’s view, then comes from continuously analyzing the data you have collected to search for new insights. The best things to find in the data are “simple, yet valuable” insights that are easily understood yet not available from traditional data processing. The recommendations from Mr. Smith are very much in line with what we do at Primary Vision. The “jewels” of our data sets are collected from a variety of target sources and no two databases are the same. While the raw data might be useful to some, the process to which we validate this data is what separates us from the competition. This cleansing process requires two important keys: time and customer feedback. This investment is an important one, one that will make you better at your job and ultimately your company more profitable so make sure everyone is on the same page commitment-wise. you cannot leverage big data unless you’re willing to commit time and feedback to your provider. if you take anything from this blog, its that last sentence. Rarely we get clients who just want a simple output. They come to us for useful intelligence about the fracturing marketplace in North America. We use our data sets to produce analysis in a format that can be readily used. With your help and time, we can uncover your jewels to help you make better actionable decisions. The data presented above has a margin of error of 5-8% as a result of E&P and/or service company errors or incorrect data filings. Neither the information, nor any opinion contained in this site constitutes a solicitation or offer by Primary Vision or its affiliates to buy or sell any securities, futures, options or other financial instruments or provide any investment advice or service.